24 March 2014. The U.S. Food and Drug Administration on 21 March approved the drug apremilast to treat adults with active cases of psoriatic arthritis. The drug is marketed as Otezla by the pharmaceutical company Celgene in Summit, New Jersey, that also reported results of clinical trials of Otezla to treat the related skin condition plaque psoriasis, the most common form of psoriasis. Psoriatic arthritis is a form of arthritis causing joint pain and swelling, but for most people with the condition, it starts as psoriasis, with red, flaky, and scaling skin. In both cases, the conditions are caused by faulty signals sent by the body’s immune system. In the case of psoriasis, the faulty signals tell skin cells to grow too quickly. 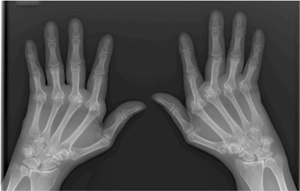 For psoriatic arthritis, the signals create inflammation in the joints. Causes for both conditions are believed to be genetic and environmental. Otezla restricts the actions of an enzyme called phosphodiesterase 4 that impairs the ability of cells to send signals moderating immune-system activity. Without that ability to control immune system activity when it’s not needed, the body misinterprets these signals resulting in the joint inflammation of psoriatic arthritis, and red, scaly skin in psoriasis. Celgene tested Otezla as a treatment for psoriatic arthritis in three late-stage clinical trials with nearly 1,500 patients taking the drug in doses or 20 or 30 milligrams, or a placebo, twice a day for 16 weeks. The three trials enrolled patients who did not respond earlier to treatments with disease-modifying anti-rheumatic drugs or biologics. After 16 weeks, patients taking Otezla experienced less pain and swelling in and around their joints. Other indicators of psoriatic arthritis as defined by American College of Rheumatology also improved, as well as overall physical functioning. In addition, the company reported this past weekend at a meeting of American Academy of Dermatology the results of two late-stage clinical trials testing Otezla as a treatment for moderate to severe plaque psoriasis over 52 weeks. The trials tested the drug against a placebo with 1,257 patients. One group, selected at random took 30 milligrams of Otezla twice a day for 16 weeks, while a second randomized group took a placebo. After 16 weeks, the original placebo group started taking Otezla, while the original group taking Otezla was randomly divided between Otezla and a placebo, which continued to week 32. At that point, patients who responded favorbly to the drug were re-randomized to taking more Otezla or a placebo to week 52. The company says results showed improvements in a standard psoriasis area and severity index of 81 to 88 percent among the groups of patients taking Otezla over the 52 weeks, compared to the placebo. Patients taking the drug from week 16 to week 32 showed similar results. Celgene also reports patients taking Otezla for 52 weeks also showed more positive results, compared to a placebo, with hard-to-treat areas such as nails and scalp, scoring 60 to 73 percent increases on standard indexes for those regions. In both sets of trials, the company reports no difference in serious adverse events between treatment and placebo patients. The most common adverse side effects were diarrhea, nausea, headache, upper respiratory tract infection, vomiting, and upper abdominal pain.